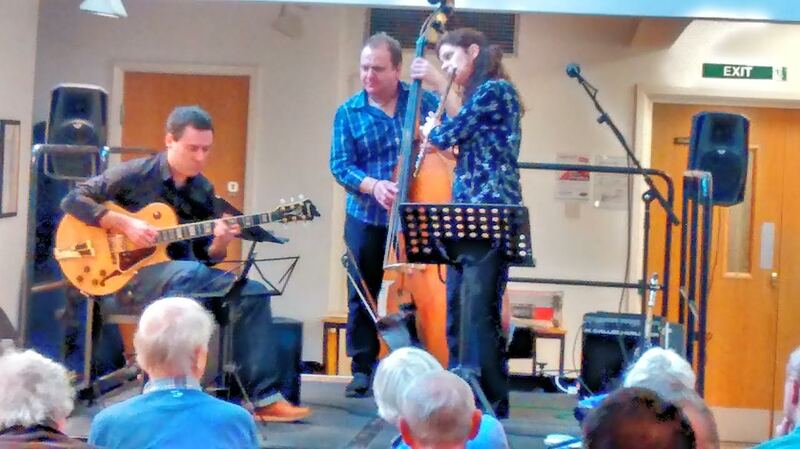 Sue Ferris (tenor sax, flute), Giles Strong (guitar), Mick Shoulder (bass). With similar events thriving in Durham and Newcastle, this much anticipated lunchtime session got off to a flying start with the ever amiable and soulful saxophonist and flautist Sue Ferris , accompanied by Giles Strong and Mick Shoulder, who seems to be chief organiser, bass player, guitarist, bottle-washer and maybe even tea and coffee maker. And very welcome the tea and coffee was too, though from the band only the lady herself was able to avail herself of this extra added touch, while her sidemen soloed; the rewards of superstardom. To my mind, she's one of the unmissables on the North East scene, alongside Lord Paul, AC and the Jelly giant. Down to tenor and flute for this short one hour set but demonstrating her virtuosity and laying her soul out there and the crowd, which hit twenty with the arrival of first reserve Alan Barnes’ sparring partner Dennis the legend, loved every minute. Mick and Giles have become the Ant and Dec of North East jazz and while I know which is which on the TV, I'm not quite sure when they share the Jazz Bandstand. Of course Mick's a seriously safe pair of hands, continuing to show his quieter side, as with Barnes a week or two back, but also getting a twang going illustrating his rockabilly leanings from a former life. Giles is proving himself a very versatile guitarist across the various bands he features in, here demonstrating a very clean sound on his clear Benson imprint Ibanez. The set featured classics and usual suspects from the GAS including Just Squeeze Me, So Nice to Come Home To, All the Things you Are, Song for my Father, Sunny Side of the Street and Sue switching to flute for Witchcraft and Black Narcissus, but the instruments brought a slightly different twist, though each soloed in turn, proving the adage that if it ain't broke, don't fix it. Numbers meant we were downstairs amongst the paintings, but if the numbers rise we could see it moved to the theatre upstairs. Forthcoming opportunities for promotion in Crook and Bishop’s appropriate imbibing holes, and with Lord Paul himself playing clarinet alongside Mick and Giles next month, let's hope for steady growth. I know I'm at work, but I suspect everyone else who was there will be back and will hopefully bring their friends and family.